Popularity 0-100 scale indicating how frequently people buy the product online. Recalculated daily. Rank: #12 out of 176. 720p High-definition, 112° wide-angle advanced glass lens combined with 345° horizontal & 115° vertical rotation range create a complete 360° coverage. Advanced night vision with 8 built-in 940nm infrared LED beads extend the viewing distance to 3 meters in pitch dark with no light pollution, so your baby or pet will not be disturbed by LED glare. Receive real-time Activity Alerts while you're out. 10-sec motion tracking records and centers the moving object. Bookmark your favorite positions (up to 8) and return to them at the tap of a button. Select Auto-Cruise to survey the area 360° horizontally or cruise your bookmarks, suitable for large areas that need a quick scan (and tracks moving objects). Supports YI Cloud to avoid the risk of losing footage from an SD card, ensure all your videos are safe, secure and protected. We provide the most efficient compression and the highest protection of data, so you can be sure that your footage is safe and secure. Reliable Wi-Fi connectivity to access your camera with YI Home App on mobile device, and YI Home App on PC at anytime, anywhere. Built-in support for 802.11b/g/n 2.4Ghz (5Ghz currently not supported) Wi-Fi band. Note: the firmware version must match your camera version. You can flash a Chinese version camera with any other version of firmware and power-on it, but it can never be paired. YI Dome is a very popular option at the bottom of the price range. It's in the top 3 bestselling dome cameras and has dozens of popular alternatives in the same price range, such as Utalent I01-W or LeFun C2 . 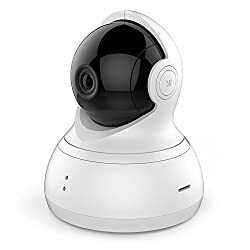 YI Dome is $38.19 cheaper than the average dome camera ($69.99). Which email should we sent deals to?